There is a sneaky, little, tomato plant trying to stealthily grow at the base of the house. He appears happy enough, with roots sheltered behind protective stones that keep the flower beds and old house siding separate. Clever plant I'd say, he's a far cry from the back of the house where the veggie gardens are. He's front and center, enjoying the south facing front of the house. Despite a few frosts this past week, he appears to be well enough. I'll probably end up feeling sorry for him, should we get a deep freeze down the road and pot him up to bring him inside. Yes, there is a 'sucker' stamp on my forehead. P.S. If you haven't entered my December Jewelry Giveaway, pop over here to do so. That is so funny! I hope he can make a go of it. I'm impressed you shot black powder. I've always wanted to try that. Have a lovely Sunday, cheers, T.
And it has blooms on it! What a trooper! I definitely think you should try to pot it up for the winter. Looks like a survivor! From one "sucker" to another :), just wanted to let you know we nurtured our own rogue tomato plant earlier this year, & it rewarded us with tasty heirloom tomatoes from late summer into early fall. It reminded me of the little engine that could! Wishing you success with your little rogue! 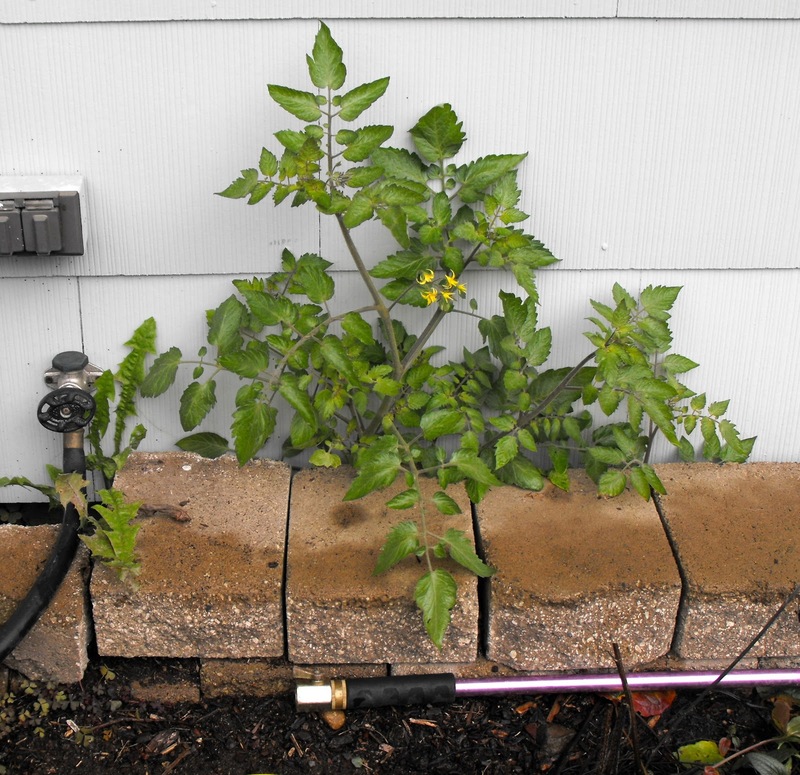 The tomato plant looks really healthy and she has blooms. Interesting. If you had a large piece of glass or plastic (old window) you could prop it against the wall to give her some protection. You have to admire it's spirit! I think you should leave it be. It's done alright so far in its random way. You're not alone in favouring the volunteers - I'm like that too. The trouble is, if you take the Tomato plant indoors it's bound to go leggy. Kelli, I wish I had something like that to build a mock cold frame..but alas nothing. IDG - I'm with you. It can just stay outside.